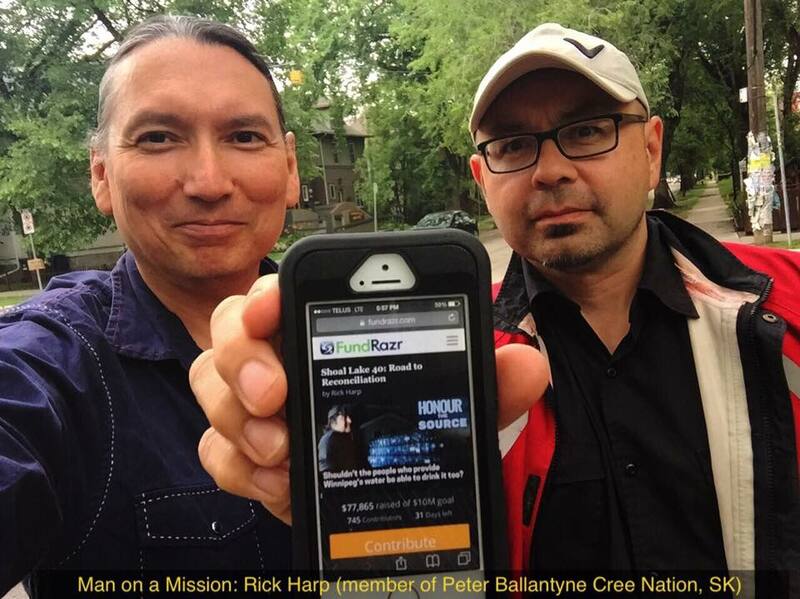 Guest contributor David McLeod provides this update on an ambitious 60-day crowdfunder launched in late June by MEDIA INDIGENA’s own Rick Harp. Rick Harp has captured national media attention for launching a crowdfunding campaign to raise $10 million to build an all-weather road to link the Shoal Lake 40 First Nation to the mainland, a community segregated onto a man-made island after an aqueduct was built to send Shoal Lake water to the city back in the early 1900s. Rick has been very vigilant on social media in creating awareness about how Shoal Lake provides Winnipeg with its drinking water (the community is located on the Manitoba-Ontario border). Meanwhile, the people within the community of Shoal Lake 40 have been living under a boil-water advisory for 18 years—one of the longest water advisories currently in place within Canada. The community faces a situation where clean water flows down the aqueduct, while murky undrinkable water is diverted towards the First Nation. Building a permanent, all-weather road would cost an estimated $30 million split between three levels of government. The City of Winnipeg and the Manitoba government have each committed to fund their part of the costs of building the permanent road. Rick says he hopes the public will fund the costs of road construction that the federal government has not committed to, a road now dubbed Freedom Road. “We now have 800 pledges,” he said. “That’s the number I’m really focusing on: how many people who have contributed. The more the better, because it shows a broad base of support,” he added. “Total pledges are at $84,110, which is quite something. It’s not $10 million but, be that as it may, I think it represents a real grassroots, groundswell of support,” said Rick. A Winnipeg multi-faith group has also run a series of events aimed at getting the word out about the plight faced by the people of Shoal Lake 40. Plus there is an online petition calling on the federal government to support the construction of a road. The online campaign is accepting donations until August 29 at 12:59 am pacific, yo!